I have a triple monitor setup (Windows 10 x64). 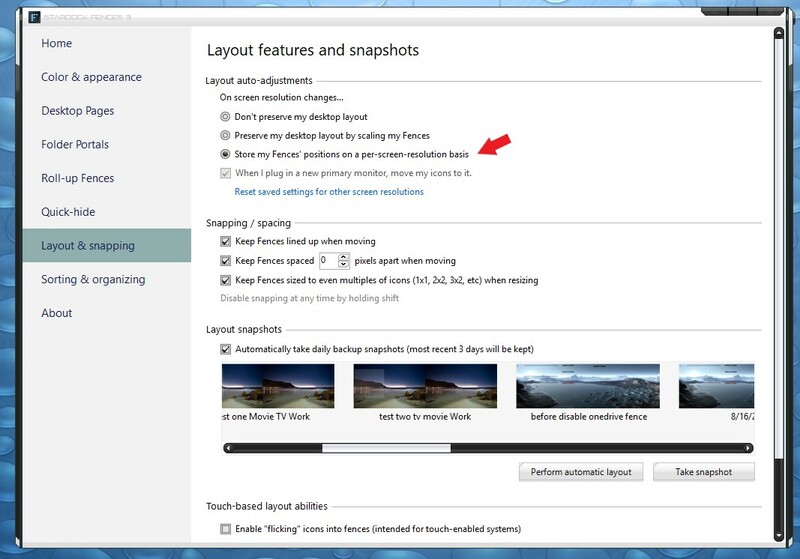 I always turn my monitors off manually, when I step away from my PC, but otherwise leave my PC turned on. Often, if my PC has been idle for a long time, I will find that all my fences have moved to a different monitor. When I try to restore a snapshot, the fences will start to move, but then snap back to the wrong screen. Sometimes, if I reboot Windows, the fences will revert to the correct monitor. This is infuriating. How do I fix this? Sorry to hear you are having issues. I need more information. 1) Windows version. Use Winver.exe for full windows version numbers. 3) And have you try this setting. I just want to confirm that this is still happening even after making the setting change you suggested.